There is no data separately for Namsai District. The data of District economy of erstwhile Lohit District which included Namsai sub Division indicates a better income level than that of state average. 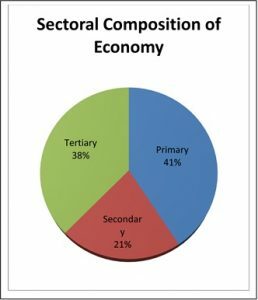 Poverty Scenario – According to 2002 BPL census 5370 rural HH were under 19 score (BPL) categories out of 12485 rural household of the district (2001) amounting to 43.01%. The Human Development Index of the district is 0.518 ranked 8th in HDI , gender development Index in 2001 was 0.538 which is same as the state’s corresponding average.